Abel Brown Southern Kitchen & Oyster Bar in Augusta embraces place and time. When you think about Augusta, the images arrive in all the shades of spring: The Master’s Tournament in April at the impeccably groomed Augusta National Golf Club, awash in azaleas. The champion’s emerald-green jacket. Boaters on the first warm days on the Savannah River and strollers and runners alongside it on the Riverwalk, beneath cherry blossoms and magnolias. But think about Augusta’s signature flavors, and the results are a more limited palette (and palate): Pimento cheese and egg salad, the Masters’ traditional and inexpensive fare. In reality, Georgia’s second most-populous city has a sophisticated dining scene that embraces more than sandwiches, however hallowed their history may be. The river that runs through it empties into the sea, within arm’s reach. Like most places rich in estuaries near the ocean, it has a strong fish and seafood tradition, especially oysters. Abel Brown Southern Kitchen and Oyster Bar embraces its place and time with smart, modern food that also acknowledges its culture. Named for a ditty about an itinerant sailor, Abel Brown understands its native clientele as well as folks who might just be there overnight and away from home. Chef and owner Todd Schafer, with long experience in Augusta restaurants, has carved out a formula that caters to both. You can choose to sit solo at the bar, or at a high top with a view of big-screen TVs, or in booths in a quieter section that allows for low-key conversation. The bar program is expert, the wines and beers interesting and affordable. The food ranges from carefully curated charcuterie and smoked fish – much of it done in-house – for tapas-style nibbling, to big honking entrees like the pecan wood-smoked ribeye. The menu changes often, according to local catches and produce, but on our visits, fish and seafood were abundant (Georges Bank scallops with risotto; bacon-crusted salmon; peppercorn tuna). Then, of course, there are the oysters – the half-shell selection given its own menu with tasting notes and salinity score (“Pearls Petites/Wakulla County, Florida/sweet with a mineral finish/5”). Those, too, vary by season and market, but on our visits the sources ranged from Florida, Virginia and Maryland to Maine and Massachusetts. The first several menu items are oyster choices – Rockefeller, half-shell, shooters, broiled, “imperial” (topped with vodka, crème fraîche, caviar and watermelon). But what can be better than some raw, briny beauties kissed by a tart mignonette, sipped with a crisp French 75 (gin and champagne with lemon, made on special request)? While the food and drink are enough to bring me back, it’s the details that separate Abel Brown from most restaurants. The warm, crusty French rolls, with soft salted butter. A briskly professional server, who even when excitedly announcing it’s her first day knows about the menu – or is willing to ask. 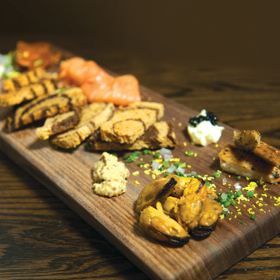 That incredible, delicately smoked fish platter, with mussels, trout and salmon, but also sliced marble rye, and accompaniments you might expect to see with caviar – finely chopped egg, chive and onion, along with Pommery mustard and horseradish cream. The attention to under-loved Southern vegetables, such as lady peas, butter beans and yellow wax beans. The little Parmesan disk over a housemade Caesar salad, sporting a jaunty boquerones (marinated white anchovy). You can certainly make a festive meal of the oysters, charcuterie, salads and sides, but the entrees are impressive compositions: That salmon, with house-made bacon, and flageolet beans, with tomato and wilted arugula in mustard crème. An enormous, wood-roasted tomahawk pork chop with bean ragout, tomato marmalade and hoecakes. Peppercorn-crusted tuna, with baby bok choy, shiitakes and ponzu sauce under crisp wonton strips. Desserts are just as impressive (Key Lime Pie in a Mason jar; classic crème brûlée; chocolate croissant bread pudding), but we’re suckers for house-made ice creams, and Abel Brown’s lemon buttermilk is the perfect end to a perfect day. All in all, it’s not a bad thing to have your pimento cheese and oysters, too. An enterprise of the Whole Life nondenominational church next door and run by its parishioners, this combo cafeteria/meat-and-three is one of the best old-school dining experiences I’ve had in a long time. Spotless, friendly and, most of all, deep-down delicious, with a mind-boggling array of rotating meats and vegetables, including fried chicken, meat loaf, pork chops, okra and sweet potato casserole. In a residential neighborhood surrounded by condos, Rae’s offers up authentic Jamaican jerk, potent cocktails and delicious she-crab soup. Dedicated to Augusta’s most famous export, James Brown, this funky little watering hole is downtown, near Brown’s life-sized bronze statue, and on the street where the legend as a child once shined shoes and danced for small change. Nearby, the Augusta Museum of History maintains a collection of the Godfather of Soul’s clothing and artifacts.